I was contacted by Emma Healey of Abel & Cole to review some products for them. Unfortunately, Abel & Cole don't deliver to the wilds of south west Scotland yet. 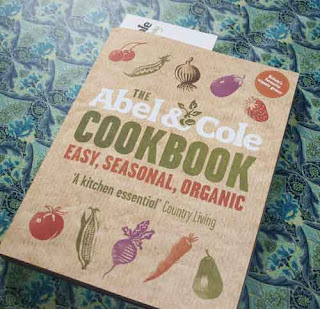 So I wasn't able to review their lovely organic veggie boxesm, but I Emma was able to send me the Abel & Cole Cookbook. It arrived on Thursday but I didn't have much chance to look at it until today. As a cookbook it is written in a very relaxed style. I enjoyed the introductions and finding out about the history of the company. The book is set out by the seasons: Spring, Summer, Autumn, Winter and the idea is that you should cook by the seasons. Even though I have only had a superficial look through the book so far, I can see that I generally don't cook seasonal produce, and how restrictive seasonal cooking would be unless you have access to the likes of Abel & Cole. Certainly the south of Scotland is not the place for growing vegetables, it is dairy, beef and lamb country. A few potatoes but the ground just isn't suitable for vegetables other than for potatoes. 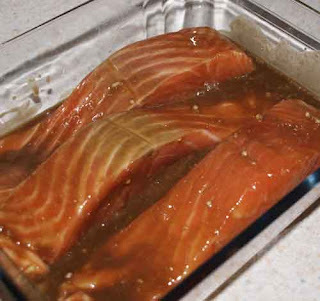 Not a Spring recipe at all, but a Summer recipe for Honey Glazed Salmon Steaks. 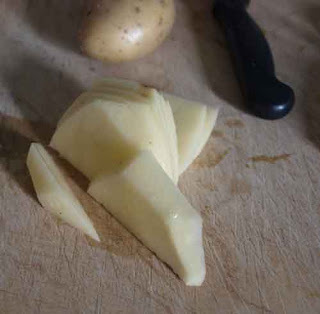 Mix together the vinegar, musard, honey, garlic and seasoning in a bowl. Brush over both sides of the salmon and leave in the fridge for about an hour. Heat a ridged fying pan to a very high heat, then rub it with a little oil. Sear the steaks for about 3 minutes on each side, turning only once. 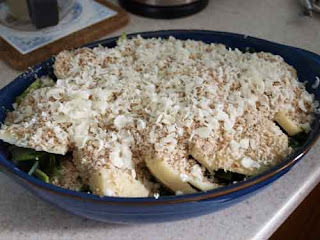 The fish is cooked if it flakes easily when lightly prised with a fork. The cooking time may vary depending on the thickness of the salmon steaks and how you like them cooked. Remove from the girll, bursh with any remianin glaze and serve. I served the salmon with roasted cherry tomatoes ( oops imported) and a Leek and Potato bake - YES, seasonal cooking at last. 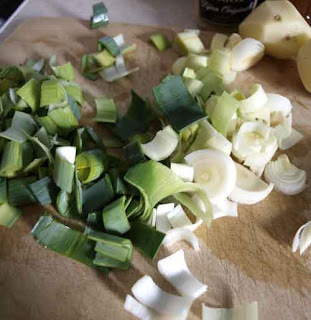 There isn't a recipe in the book for a Leek and Potato Bake, but there is one on the Abel and Cole website HERE. 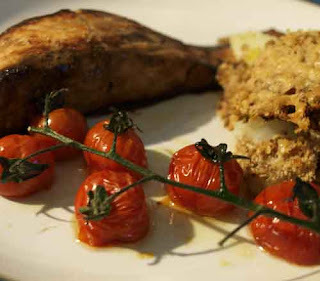 The salmon was moist and delicious and the leek & potato bake went very well with it, as did the tomatoes. I'll be back with more recipes from the Abel & Cole Cookbook very soon. That salmon sounds lovely - I'm thinking it would be great on the barbie. Really interesting stuff. I looked at Abel & Cole's website and while they do deliver in my area, I already get an organic fruit and veg box from a local family-run business who I'd rather keep on supporting than buy from a national company. If we didn't have that though, I'd probably buy from Abel & Cole. I'd like to buy their bread, but you have to spend £10 in order to get a delivery and I don't think I could spend £10 a week on bread! And we were full time and probably wouldn't be in to receive a delivery. Oh, well! They don't deliver in the South West either, I tried once when they had a special offer on, but to no avail! The Abel & Cole cookbook has received good reviews on blogs and so it must be good! More Chocolate - this time to give away!